In 2014, International Fight Week — the sport’s July showcase event — generated more than $190 million in economic activity, by one count. “It is a huge economic force for the local community,” UFC Chief Operating Officer Lawrence Epstein said. “The first big bucket of economic impact that we have is basing this very large entertainment and sports-media company here in Las Vegas. We have 375 employees worldwide and about 310 in Southern Nevada. It’s an important economic engine in and of itself just basing this business here. Local businesses have also benefited from the success of the UFC and the popularity of MMA. The Applied Analysis survey reports that Fight Week visitors spent 4.2 nights in Las Vegas, while other visitors average 3.3 nights. Of those 4.2 nights, 87 percent are spent at a local hotel. MMA fans spent $1,898 in nongambling expenditures per trip compared with $699 by all other visitors. Those numbers do not include airfare and transportation costs. When it comes to gambling, Fight Week attendees spent $2,922, while other visitors spent $1,075. Other local companies are supplying services directly to UFC. “In addition to our business, you are seeing a lot of training operations, a lot of athletes move here to be closer to the headquarters of the UFC and the center of the MMA world,” Epstein said. “We’ve seen a variety of production companies that have grown — companies that provide everything from lighting and other services we need to put on our events. The popularity of MMA is growing around the globe. According to the survey, more than 65 percent of Fight Week attendees would like to see more amateur martial arts tournaments during the weeklong event, which should help increase local amateur promotions such as Tuff-N-Uff. Although the numbers are not available from this year’s Fight Week survey, Epstein said the mid-July event was clearly the biggest. He estimates that Fight Week and UFC 189 generated about $200 million in economic impact for Southern Nevada. 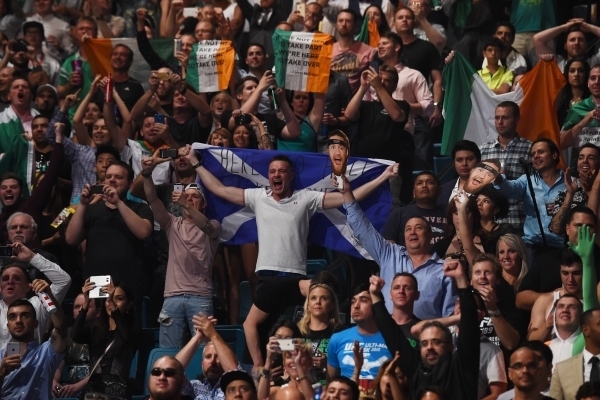 Besides the big draw of UFC 189, the UFC rented out 550,000 square feet at the Sands Expo and Convention Center to build out a variety of experiences for fans, including autograph sessions, retail opportunities, UFC-related experiences, and hosting martial arts competitions. All of this is good news for Southern Nevada. As the sport and the UFC grow, expect local businesses to benefit more economically. One such ripple could be the opening of a combat sports-themed store by Adidas, planned in the next 18 months near the Strip, to take advantage of the rapid growth of the sport, said Scott Viscomi, president of Adidas’ combat sports line. Adidas currently sells its combat sports gear in the Las Vegas Fight Shop in the Miracle Mile Shops. “MMA has grown from a niche sport into a national phenomenon,” Viscomi said. “It has gone mainstream now that it is on live TV like Fox Sports. As that has occurred, the retail opportunities have opened up and gentrified from the fight shirt market to a full collection of training apparel.